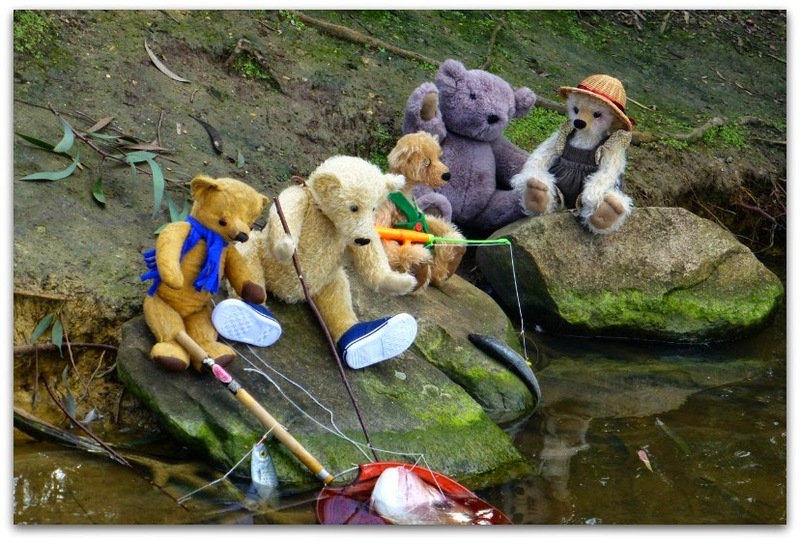 I had to share these photos with you of our great fishing day. I couldn't sleep the night before wondering if I had forgotten any thing. Bait, fishing lines, hooks, Band aids encase some one hoked them selves. Plus of course SNACKS.. like chocolate, honey biscuits, and peanut cookies. We picked a good spot by the lake, and put out the rug for the girls or any one else that didn't want to fish. 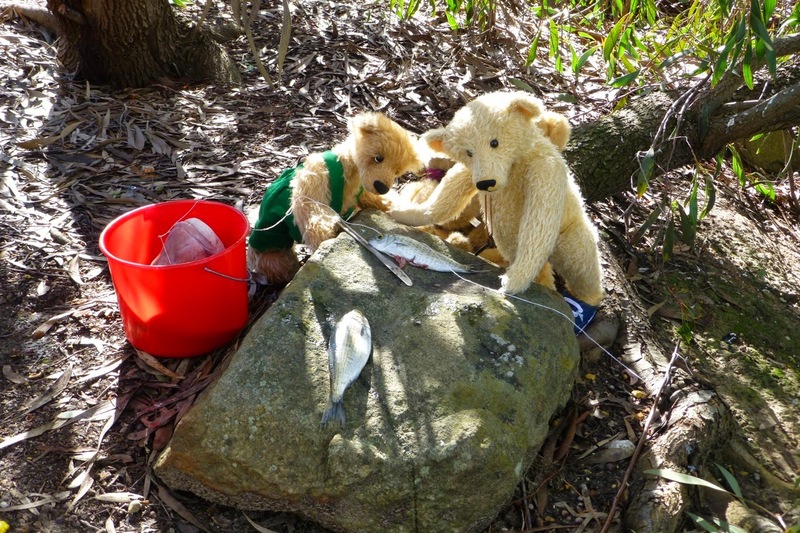 We had a very experienced old fisherman Percy that was helping out, giving tips to the younger bears, as well as myself, so they learnt a lot. 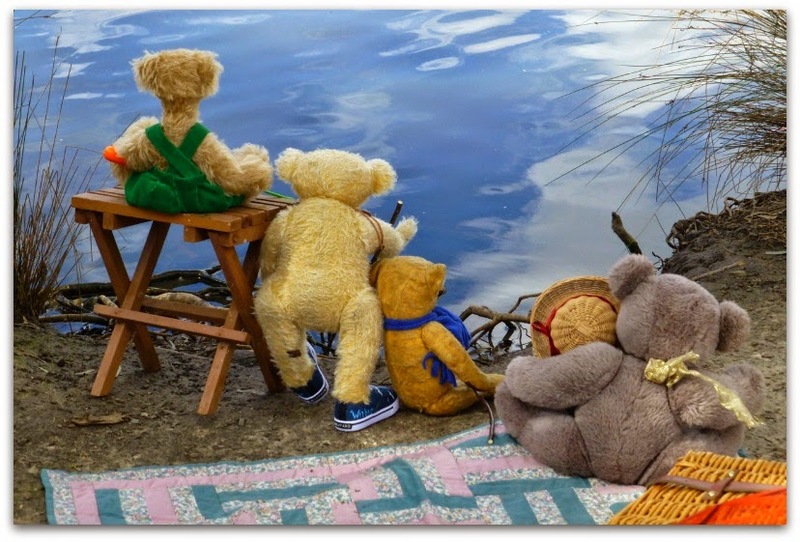 Percy is the bear with the blue bow and Burt is the bear with the green overalls Plus Shirley who was in deep conversation with Boof. Whoopy dooo.... We caught a whopper.. can you see his big head poking out of the water. There was much discussion in how to get him to Shaw. The girls were scared, they said "he had a big mouth. Would he eat them?" I ask you!!!!! Of course I told her we eat the fish..If we are lucky enough to land it. With Percy's help we got him in the net. We were all so excited, we had not caught one so big before. We are going to have a big feast to night. We just got him hauled in when the ducks came. I would have been mad as hops if they took the fish from our line. We caught 3 other nice little fishies so the next thing was teaching the how to scale and gut the fish.... (Guess who ran away at the stage.) Girls???? We picked a nice big stone that was clean and the scales flew every where. Then the tummy came out.. Phewww.... Was I a happy camper when our bucket was nearly full. We could not stop looking in that red bucket, just encase we were dreaming, we caught so much. What a great dinner we will have for our last meal together. Because camp finishes and we all have to say good-bye for another year. Before we left I found 2 mins. 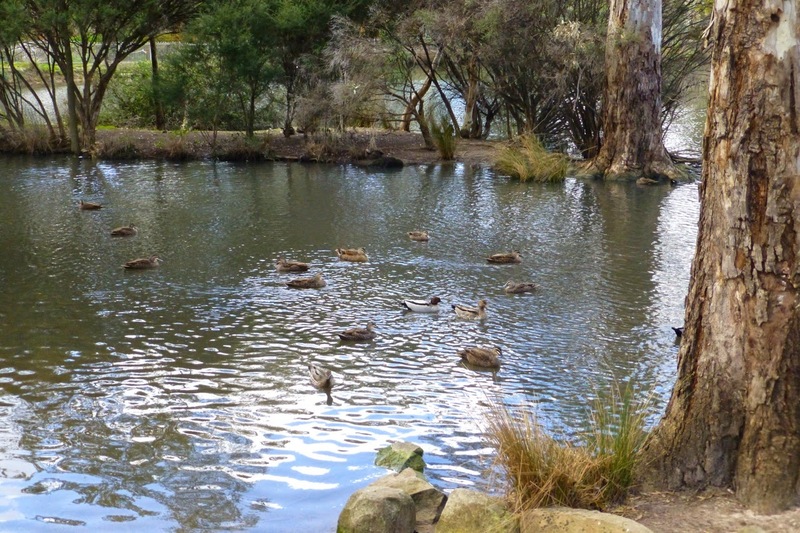 to be by myself and look at this beautiful spot, and think of all the wonderful times we had together. Then we went back to camp and ate our fish and told stories around the camp fire under the old oak tree. It's always hard to say good bye to Prudence, we had the best time and our bond of friendship grew even stronger. Bye every one, I will look forward to see you all next year. 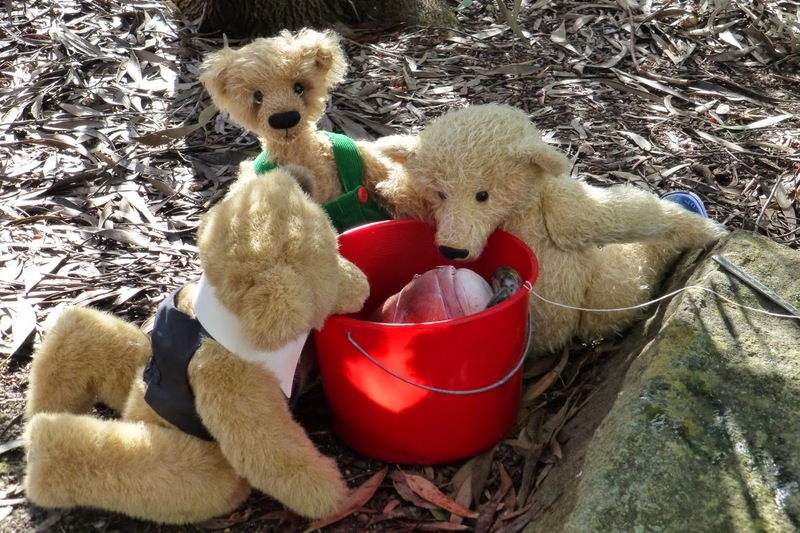 All of the fisher bears, keep fishing and write to me about your catches. Not the ones that got away. This is for all my friends in Bloggerland, that read my story. why do the always turn up at Picnics." 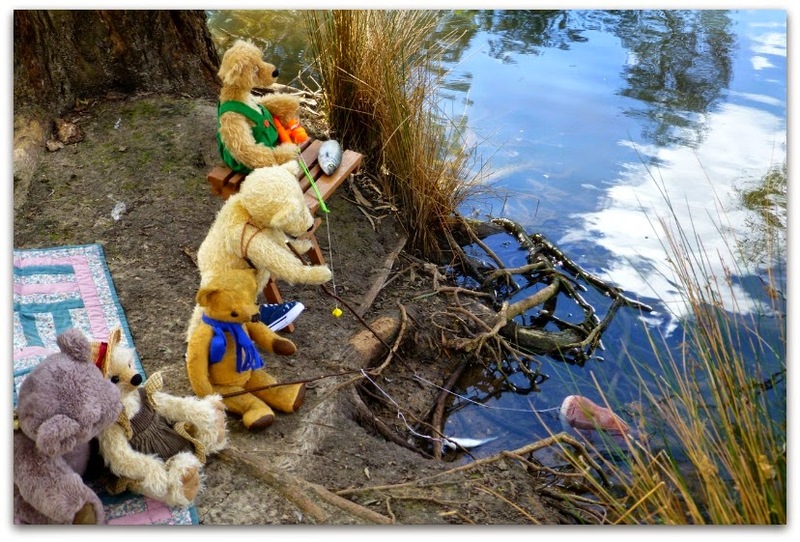 Aren't you the clever fishermen - so glad that you were able to enjoy a wonderful fish dinner. It must be sad with camp finishing but know you must have lots of happy memories to go home with. Lovely story and very realistically photographed and told! You are doing a marvelous job at that. Sending you hugs for a happy Sunday. We got home at dinnertime and I sure could have feasted on another fish dinner. WOW, that supper was so beary good. 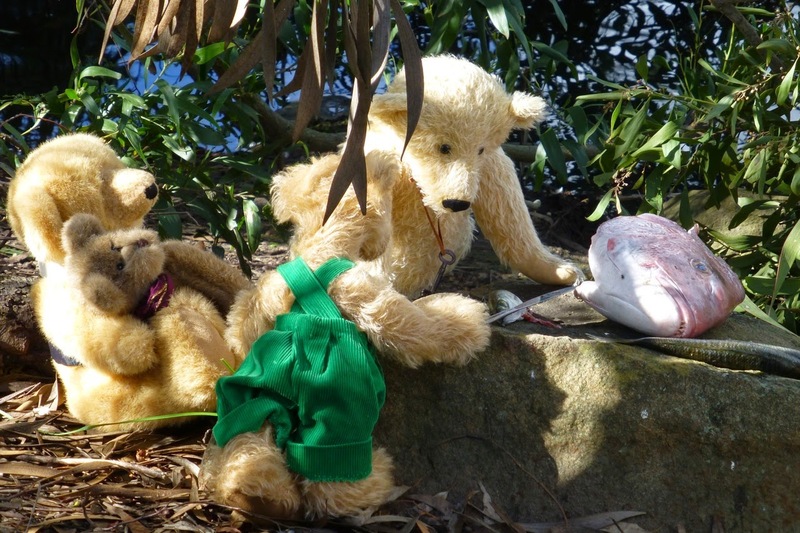 Nobeary cooks fish on an open campfire like you do. I am going to dream about camp tonight. I miss you so much. Another great story, Wilbur! I would have loved to have fished with you. :-) It looks like such a nice day. It is so hard to say goodbye, but at least you have some wonderful memories of camp to take with you. It looks like you had a great last dinner at camp. Have a safe journey home. I have been looking forward to the next episodes every time! Time to go home, or, maybe you are at home allready....I bet you will hug Granny SOOOOOOOOO much......and in return! ps WHAT A BIG FISH!!!! Wonderful work. Lovely photo, Kay! Ohhhhhh Kay, zit hier echt te genieten van dit mooie verhaal. 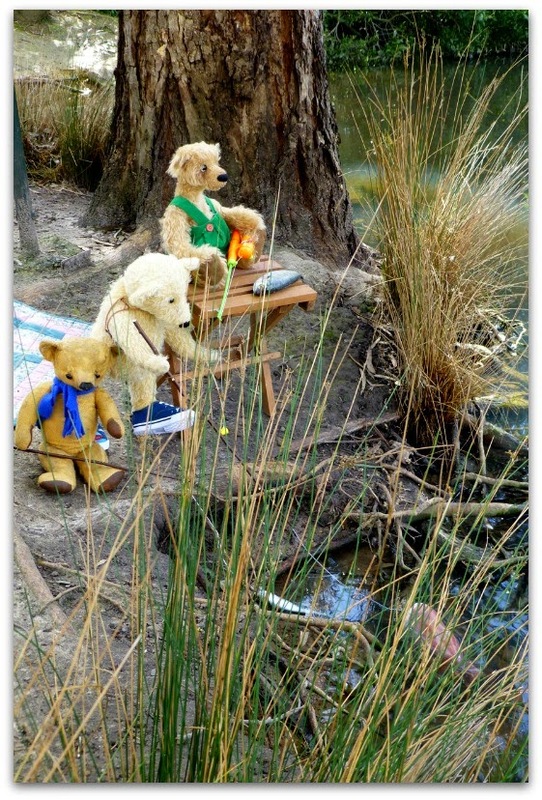 In gedachten zie ik jou al slepen met alle beren op zoek naar een geschikte locatie om dit prachtige verhaal in elkaar te zetten. Zie ze toch allemaal naar de rode emmer kijken en genieten van de grote visvangst, haha, moet steeds glimlachen bij die mooie verhalen die jij allemaal verzint. Je kan er wel boeken over gaan schrijven en dan allemaal verkopen, succes verzekerd!!! Mijn complimenten!!! What a whopper you caught, Wilbur, and an excellent tall tale (or, is it a tall tail?)! We're glad to know you're home again, though - Granny needs you. what a catch! 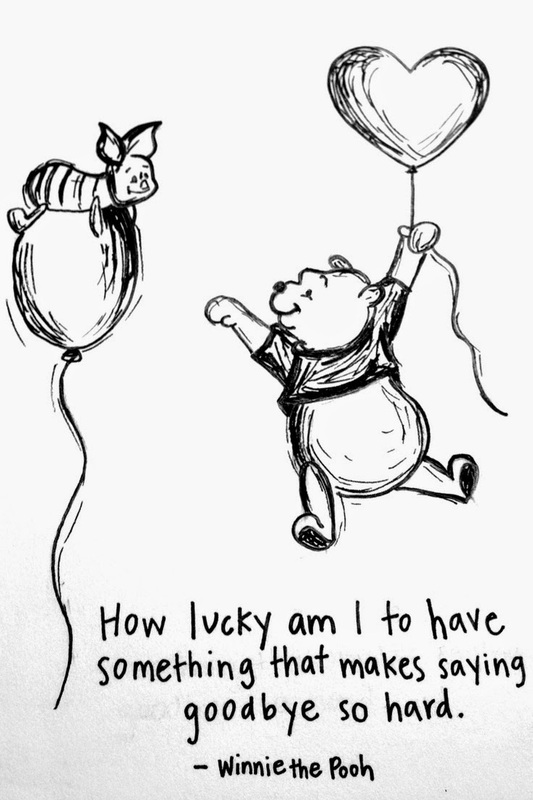 :) don't be sad with camp finishing - it's the beginning of something new, some new fun and new joy. Lovely story!!! 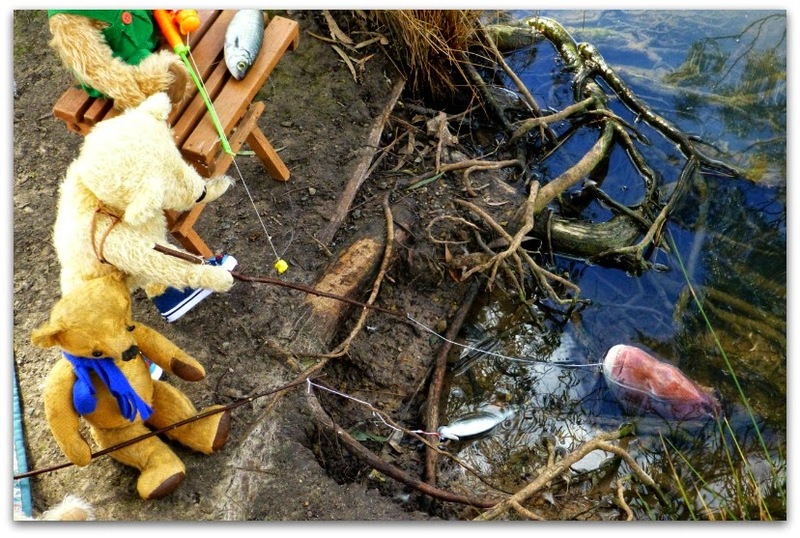 Super fishing! )) So cute! What a fun story and great photographs. and for your words of encouragement. Wish I could join the bears for the day! Totally agree with your 'thought for the day' lol. OH my goodness, Wilbur, who couldn't have had a good time where you went! I am glad your back with your Granny though. You have some Granny there! She has gone to a LOT of trouble to see that your have a lovely time at camp. She is truly wonderful! My Mom is all wrapped up in her wallpaper. No..I mean she is ALL WRAPPED UP IN IT! Poor woman needs help. heh heh! Such beautiful photos Kay - just a magical setting! anticipation to see you all again next year. But I´m sure you must be happy to see your Granny again soon! Wow Kay taking the kids fishing! Looks like you had a lot of fun! Did I tell you that I used to make bears many years ago. I still have a few living with me still!